Brahmapur (earlier known as Berhampur), nicknamed "The Silk City", is a municipal corporation located on the eastern coastline of Ganjam district of the Indian state of Odisha, about 169 kilometres (105 mi) south of the state capital, Bhubaneswar. It is one of the oldest and largest cities of Odisha. It is famous for its silk saris, temples and unique culture. The population of the city is 355,823 as of the 2011 Census of India (provisional), making it the fourth most populous urban city in Odisha state and 122nd in India. Brahmapur is one of the oldest and most prominent settlements between Visakhapatnam and Bhubaneswar. 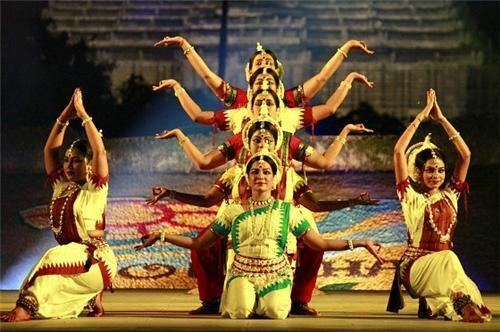 Oriya culture has been prominent in the area since ancient times. Since this region was merged with the Madras Presidency during the British era, a large number of South Indians (mostly Telugu and Tamil) were employed here by the British government. The city is famous for the shops in Bada Bazaar, Annapurna Market and Bhapur Bazaar. Theatre has been very prominent since the late 1930, and was the main source of entertainment until the advent of motion pictures. Ganjam Kala Parishad and Prakasam Hall, located here, are some of the oldest drama halls in India. The oldest theatre in the history of Odisha was the Sri Sitaram Vilas Talkies (SSVT, established in the year 1927) which was closed down following severe damage by a super cyclone on 29 October 1999. Brahmapur is very famous for its papadum, aachar (pickles) and various kinds of badis. Brahmapur is well known for its intricately designed silk saris and handloom cloth and hence is known as the Silk City. It is also a big market place for fruits especially mangoes as they arrive from the orchards of nearby Andhra Pradesh state. Night life in this town comes alive with some glitter and bustling shops around Annapurna Market, some market complexes down the market street and Ramlingam Tank road, where people sit there and enjoy the evening. The streets around Goutam Cinema Hall are famous for street-side food, though hygiene of the food can be questionable. Western-style dress has gained greater acceptance among men, although traditional dress like the dhoti and kurta are seen during festivals or other religious occasions. Many women normally wear a sari or a shalwar kameez, though western attire is becoming popular among younger women. There are many temples in Brahmapur, including Lord Sidha Vinayaka Temple, Lord Nilakantheswara Temple, Lord Sri Radheshyam Sunder Temple, Bhairabi Temple, Taratarini Temple, Venu Gopalaswamy Temple, and Budhi Thakurani Temple. Software industry Many software companies have set up their centres as Brahmapur offers opportunities associated with Grade II and grade III cities for BPO and software companies. The third software park STPI- Berhampur of the state and 51st in the country, was inaugurated on August 20, 2010, at Brahmapur. Bi-Annual Thakurani Yatra – The Festival of the Goddess : This welcomes the goddess Budhi Thakurani to her temporary abode for the biannual Thakurani Jatra (festival) late at night. The hereditary head of the festival, who is also regarded as the head of the weaver Dera community of the city, Desibehera, dressed in his traditional attire, visits the Budhi Maa Thakurani temple to invite the goddess to her parental abode at his home on Saturday afternoon. His wife also accompanies him, and they make offerings at the Kalika temple. Rituals to welcome the deity for the festival started at the temporary temple built at Desibehera street from evening with the Changudi Puja. After these rituals, flowers are carried from Desibeheras house to the Budhi Thakurani temple. Fallen flowers are carried as representative of the deity to Desibehera Street in a large decorated procession at night. The Thakurani Yatra is celebrated in different parts of Ganjam district. One such major biennial Thakurani Yatra is Lanjipalli Thakurani Yatra. Gopalpur Beach : This is 16 km from the city and the Gopalpur is a retreat for sun, sea and sand lovers. At one time it was a busy seaport and it still displays the crumbling walls and pillars of the jetty. There are various town buses that run from Old Bus stand to Gopalpur. It is quite convenient to drive to Gopalpur on ones personal vehicle. Gopalpur once used to be a bustling place with tourists. There are many good hotels like Oberoi Palm Beach resort. It is a lesser known fact that, Oberoi Palm Beach resort was the first property to be acquired under the Oberoi Group brand. Gopalpur has an old light house, and a small fishermans cove. The Gopalpur Beach Festival is also held here. The people of Brahmapur celebrate all the major festivals of Odisha, like Rath Yatra, Durga Puja, Diwali, Kumar Purnima or Gaja Laxmi Puja, Manabasa Gurubar, Raja Sankranti, Makar Sankranti, Bishuba/Pana Sankranti or Oriya New Year, Dola Yatra or Holi, Chandan Yatra, Gamha Purnima or Rakshya Bandhan, Kartik Purnima, Nabanna, Janmastami, Ram Navami, Saraswati Puja, Ganesh Puja, Ugadi, and others. Some festivals are unique to the City, like Sharad Purnima or Kumara Purnima. In Kumar Purnima, all the girls do Janiusa Puja and pray to Tulasi Maa for blessing them with a good life partner. Every two years, a festival is held in honor of the main deity of the city, Thakurani Maa and the festival is known as Thakurani Jatara/Yatra. It is said that Goddess Thakurani Maa come to their parents home during the holidays for some days from her in-laws home. Sitala Shashti Jatra is celebrated during the month of June every year to mark the wedding of Lord Shiva and Goddess Parvati. The other communities of the city such as Telugus, Marwaris, Punjabis, Bengalis and Gujaratis celebrate their festivals along with the major festivals of the city.